Edition of 2326 of which 125 copies are signed 1-125, 26 copies are signed A-Z as artist's proofs, three sets are signed as progressives and 22 are signed as dedication copies. 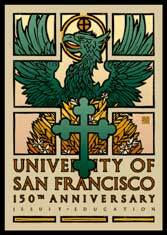 Client: University of San Francisco, 2130 Fulton Avenue, San Francisco, California 1-125: Saint Hieronymus Press, Inc.
Phoenix-like, eternally renewed, the flame of knowledge skips from hand to hand, from body to body, from mind to mind, using us as a vehicle to attain its own ends. The old is overturned, the new takes its place. We do not think of ourselves as stepping stones, anymore than we consider the rocks in the stream. Just a means to an end. But the stones themselves--what do they think of us?